This is going to be a quick giveaway! 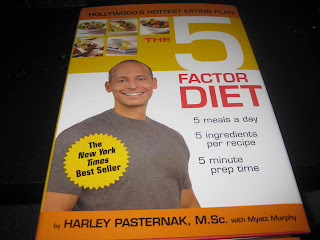 I'm going to give one lucky winner a Hardcover Copy (worth $24.95) of Harley Pasternak's book, 5 Factor Diet. I originally won one of these about a month ago, along with an online subscription, and then I won the book again! It just came today and I'm dying to pass it on to someone else! So... one of my readers will be the lucky recipient of this book! Remember when I mentioned here last week about becoming a new me? Well this book and the fact that I now have access to this information, plus I just bought some workout gear for the house (one of those big balls with a DVD and an over the door gym!!!) are my inspiration to becoming a new me. I'm so overweight right now, that I'm not happy and I realized it's part of the reasons for what is going on in my personal life right now. This book is going to help me on my journey, and I'd love for YOU to join me! This plan is designed to give you results in five weeks! And it's so easy and effective that you may naturally turn your five-week plan into a lifestyle (as many of Harley's personal clients tend to do). Say so long to hunger and cravings. By eating five 5-Factor meals every day, not only will you start losing weight but you'll feel less hungry throughout the day! Eating delicious and healthy meals doesn't have to be hard. Members get hundreds of recipes that use only five ingredients and take only five minutes to prepare. Based on Harley's training experience, he believes that working out more often for shorter periods of time is more effective than spending hours at the gym. Taking a diet break one day a week can empower you. You should never feel as if you're in a diet prison! Plus, Harley believes that controlled cheating can actually help you reach your goals. Learn more about this diet and book here. Learn how it works here. Leave a comment. Yup, it's that easy. No rules this time because I want this contest to be over next week. Spread the word via Twitter, Facebook, or your fave Ning site. Leave a comment for each additional entry. Be sure to leave me your email address if it's not publicly available in your profile. This giveaway ends at midnight EST on 5/11/09. Remember how I keep telling you about the MomLogic Community? Well I won these from the Zip Up Your Jeans group! Stop by and check it out! Sounds like a great book! I need something - summer is almost here!! Oh how I could use this book! Please please help me lose this baby weight. This sounds like a book I could use! Thanks! I think this looks like just what I need to give me boot int he behind! I would love to win it. I've been needing to find something to motivate me to get in gear and start taking care of myself better and this book would be a wonderful way to start.